Also called La Serenissima, literally meaning ‘the most serene’, Venice was one of the four maritime republics in Italy, the other three being Amalfi, Genoa, and Pisa. The term ‘Serene Republic’, however, more successfully suggests the enormous power and majesty of this city that was for centuries the unrivalled mistress of trade between Europe and the Orient. It suggests too the extraordinary beauty of the city, its lavishness and fantasy, which is the result not just of its remarkable buildings but of the fact that Venice is a city built on water, a city created more than 1,000 years ago by men who dared defy the sea, implanting their splendid palaces and churches on mud banks in a swampy and treacherous lagoon. Venice is built over ruins dating back to the Roman Empire. 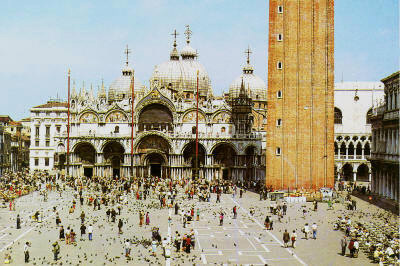 According to myth, Venice was established in 811 AD when a flock of pigeons carrying a white cross flew here. In 823 AD, St. Mark, symbolised with a winged lion and the patron saint of Venice, came to these islands. The city used to be headed by the Doge, a Latin word for ‘leader’, and a figure unique to Venetian politics. In the 13th Century the fourth crusade led by Pope Innocent III, consisting of approximately 20,000 soldiers from France, Spain and Germany, arrived at Venice on their way to the Holy Land to reclaim it from the Muslims. Venice asked for a very heavy price to allow them to pass through which the soldiers could not afford and they, subsequently, headed for Constantinople instead to explore the near east on Venetian orders. The most famous of these travellers was Marco Polo. During the 14th and 15th Centuries, Venice established schools which lasted for over 600 years and were the envy of Europe. These schools were attached to the churches and taught a trade bound by common nationality, charity and religion. They fell into decline when Constantinople was captured by the Turks. Eventually Venice came under Austria and stayed part of the latter until brought back to Italy by Napoleon Bonaparte. One hundred and fifty small side canals, the grand canal and its one and only main square, the Piazza San Marco, dominate Venice. The Piazza is both the religious and political centre of the city. The Ducal Palace, dedicated to the Doges, and the Church of St. Mark with relics of the saint, are both situated here. The Grand Canal, the main thoroughfare route, is dotted with numerous Venetian palaces of remarkable beauty. The canal narrows and boat traffic increases as one approaches the famous Ponte Rialto—Rialto Bridge—arched high over the waters. The windows in the arch belong to the shops inside. This is the commercial hub of the city, with open-air vegetable, fruit, and fish markets on the left, and on the right, an upscale shopping district. When Napoleon entered Venice with his troops in 1797, he called Piazza San Marco “the world’s most beautiful drawing room” and promptly gave orders to redecorate it. His architects demolished an old church that stood at the end of the square farthest from the Basilica, and put up the Ala Napoleonica [Napoleonic Wing] to unite the two 16th Century buildings on either side. Today the arcades of these three grand buildings shelter shops and cafés. The Tetrarchs dating to Roman times stands in a corner of the square. 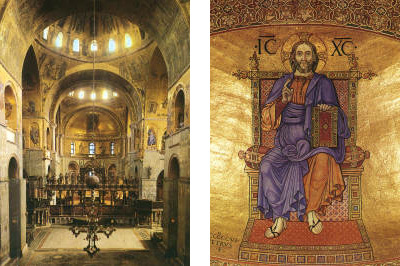 The Basilica di San Marco is one of Europe’s most beautiful churches. An opulent synthesis of Byzantine and Romanesque styles, it is laid out in a Greek cross topped off with five plump domes. Begun in 1063 and inaugurated in 1094, it was built to house the remains of St. Mark the Evangelist, which were stolen from Alexandria two centuries earlier by two agents of the Doge. St. Mark, the founder of the Coptic Church in Egypt, was the Adriatic missionary from Libya who went north into Europe and wrote the gospel. The story goes that the Doge’s agents stole the Saint’s remains and hid them in a barrel under layers of pickled pork to get them past the Muslim guards. These remains were finally returned to Alexandria by Pope John Paul II as a symbol of peace. Four bronze horses transported from the hippodrome of Constantinople by the Venetians in 1204, after the Venetian conquest during the fourth crusade, stand atop the Basilica, symbolising the power and force of the Republic. The three exterior facades of the church are richly decorated with marble inlays. The various statues of diverse origin and importance and classical and mythological subject matter of the reliefs stressed the idea of the state as sacred, noble and traditional. In Venice, the Doge elected the Patriarch and bishops without any interference from Rome. Gold, used everywhere, including the exterior in the four large lunettes, assured the people that Venice feared nothing. The interior confirmed the concept of magnificence and uniqueness. The flooring is in marble mosaic, the columns of rare marbles, and the walls lined with marble in various colours below and mosaics in coloured glass and 24 carat gold above, as are the cupolas. One has the impression of walking over a rich oriental carpet, surrounded by a half light which accentuates the gleaming richness of the golden mosaics. The golden altarpiece inside was the last work of art left intact at the fall of the Republic and is a testimony to the vast wealth of the state treasury. It is a singular unique example of Gothic art measuring 3.5 by 1.4 meters and inset with oriental enamels of various eras, and precious and semi-precious stones. Campanile, the tall brick bell tower in the square is a reconstruction of the original, which stood for 1,000 years before it collapsed one morning in 1902 without warning. The view from the tower on a clear day spanning the city, Lido, lagoon, and mainland as far as the distant Alps, is breathtaking. The Basilica and Campanile, two essential elements of the Piazza, seem almost abstract symbols of the Orient and Christian worlds, the former decorative and curvilinear, the latter severely austere. For centuries divided, these worlds were brought together in Venice and reborn through the centuries of her history. Rising above the Piazzetta [small extension to the Piazza] San Marco, the Ducal Palace is a Gothic-Renaissance fantasia of pink-and-white marble, a majestic expression of the prosperity and power attained by Venice during its most glorious period. It has a delicate weightless quality, rather like lace, due to its softly coloured design motif, pinnacles and aedicules. It was began in the 9th Century and the Republic spared no expense in embellishing both interior and exterior. At first it resembled a castle and was built for primarily defensive purposes. The present building retains the Gothic forms of the 14th Century with wide open loggias and windows. The main entrance is through the Porta della Carta or Paper Gate leading to the Giants’ Staircase. The palace had well defined functions with rooms dedicated to the Doge’s private apartments, various magistracies such as the College and Senate, Palace of Justice with Courts and the Prisons, the Armoury, Great Council Hall, Hall of Scrutiny, Hall of Four Doors and Hall of the Antecollege, to name but a few. The Golden Staircase is the official route along which one passed inside, on one’s way to the audience halls. All rooms were richly decorated with stuccoed ceiling panels and framed frescoes by Tintoretto, Veronese, J. Palma the Younger and other leading artists of the time. In the Great Council Hall, the largest hall in the palace, measuring 54 meters long, 25 meters wide and 12 meters high is Tintoretto’s masterpiece The Last Judgement, a kaleidoscope of figures in movement and the artist’s largest piece of work. Overlooking a side canal, is the Bridge of Sighs connecting the prisons and court rooms. Marble tracery windows in the bridge gave prisoners their last glimpse of the outside world. Casanova was the only prisoner to escape through the roof of the palace. Across the waters of St. Mark’s Basin facing the Piazzetta, is San Giorgio, an island with the Palladian church, Church of Santa Maria della Salute and Dogana [customs house]. Palladian is a classical Roman style of architecture developed by Andrea Palladio in the 16th Century, in which columns are built into the walls of the facade. The craft of murano glass started in Venice in the 11th Century. A highly ornamental and creative form of hand-blown glass, murano glass-blowers need to have a minimum of 15 years experience to be qualified for independent work. The most expensive glass is the red coloured as it contains gold. Painted black, 1,000 pounds in weight, 1.4 meters long with the left side longer than the right by 20 centimetres, the gondola epitomises all that is romantic and historical in Venice. In earlier times, Venetians used logs of wood to sail through the canals. The rich decorated their boats in gold and semi-precious stones. Venice was then hit by the plague in the 15th and 16th Centuries. The state, thereafter, passed a law enforcing all boats to be painted black as a sign of mourning. And they have since stayed black. This entry was posted in Exploring our World, Italy and tagged Basilica di San Marco, La Serenissima, Murano Glass, Things to do in Italy, Things to see in Venice by Rama Arya. Bookmark the permalink.